The Oh So Succulent stamp set and matching dies, Succulent Framelits, are so awesome and sadly they are on the retiring list. That means that after May 22nd they could be sold out!! And after May 31st, they will no longer be available. See all the retiring details below. I got this wonderful card, from fellow Stampin’ Up! demonstrator, Liane Binder, from British Columbia. We made this card at a recent stamp class (sign up to get my class news here) and everyone loved the bright fresh colours and the fun technique. Technique: Stamp the image with Basic Black ink. Use a sponge dauber to lightly dab the colour in the centre of each flower. 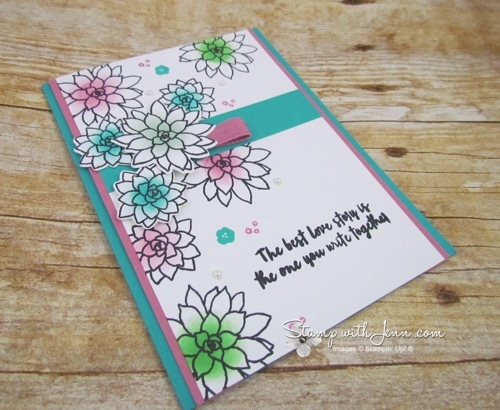 What a fun way to add colour quickly and easily to a card. We also use the Succulent Framelits to cut out a couple of the flowers in the middle. 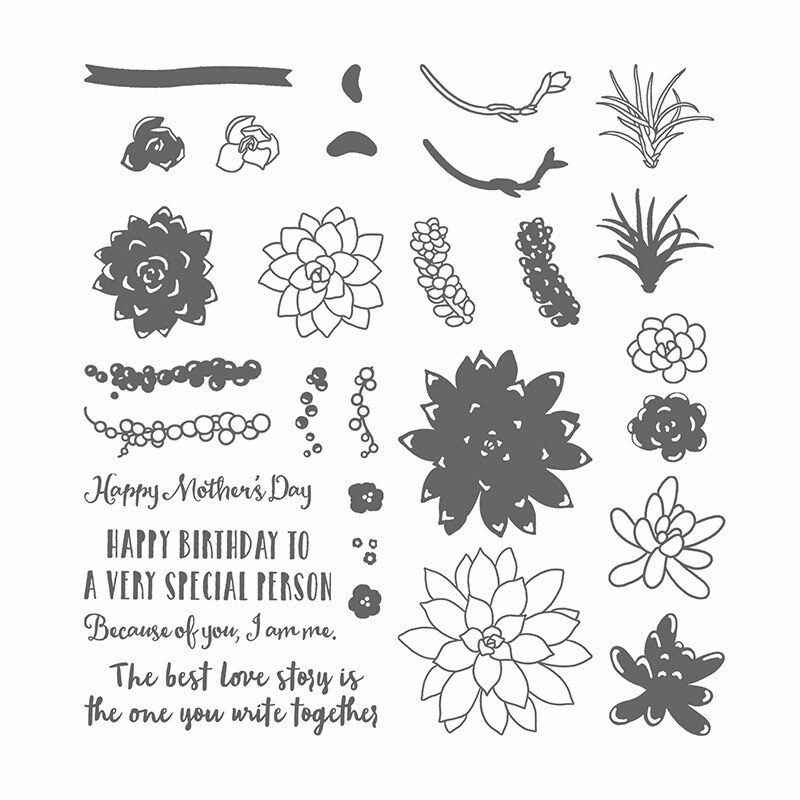 Style: The saying on this card is meant for a wedding, but people also choose the Birthday saying or the Happy Mother’s Day saying from the set (see the set image below). 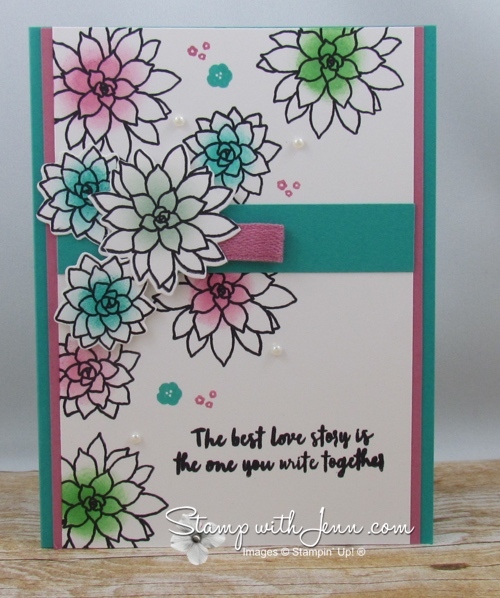 I love all the little pieces in this stamp set like the little teeny tiny flowers on this card. There is a bundle for this stamp set and dies, but right NOW they are cheaper to buy separately because they are on sale. Don’t miss your chance to get these awesome Succulent products. You can email me to order or click on any item to go to my Online Store. All retiring stamp sets are guaranteed only until May 22nd. And accessories (like the Succulent Framelits) are only while supplies last. Browse all the retiring items here in my online store. I’ll have another couple of items to show you using the Succulent products later this week at www.stampwithjenn.com.